I’m looking for a 10 tooth pinion. I figure someone in the club maybe has one lying around. email jakevisser@hotmail.com. Thanks. I'm in search of a pick up box. Rough field find is what I'm ideally looking for. Let me know if you have any contacts or know someone with one. Wanted: I am looking for a 26-27 Model T Ford coupe driver’s door. I’m working on a 1926 TT. Looking for 1926 complete engine. Would prefer a running unit. Would also entertain buying an entire truck if it was cheap enough, because I’m cheap! Model T business for sale! I am a real estate agent in Kansas. I have an established Model T restoration/dealership and parts salvage business for sale in Iola, Kansas. I am wanting to reach any and all Model T enthusiasts with information of this opportunity. Is there a way I can have this information sent to your members? For Sale: 1927 Ford Roadster Pickup. Great winter project. Wire wheels, no fenders, splash aprons, or running boards. The box is made from pine wood from the owners acreage and is a 1925 box pattern. Motor is good. Hood included, radiator(high) and grille shell, running board brackets and many extra parts. $5000. Willing ‘to flip (split??) the shipping’ - Marcel 204-742-3475 in Manitoba. 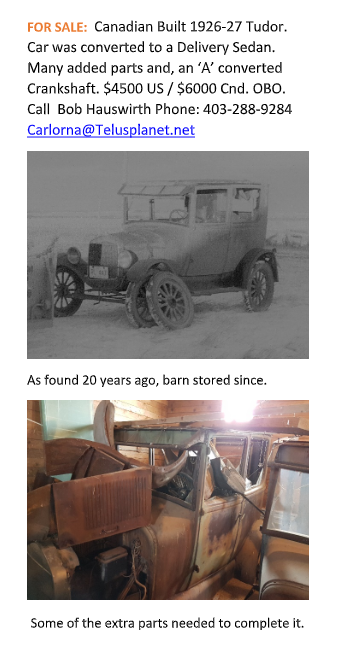 “For sale: 1927 Ford Model T Coupe (barn find). original condition, mostly there. Would run, with clean up, wire wheels, still has parts of interior, $4000.00. 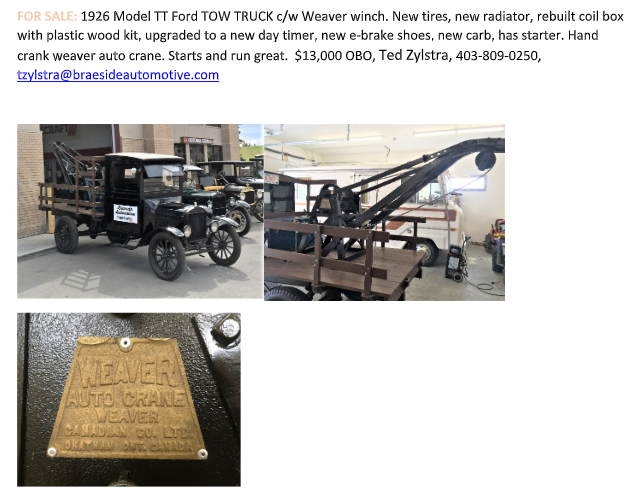 1927 Ford Model T Roadster, (barn find), wire wheels, would run, missing top bows & hood, has turtle deck with lid, $4000.00. He is looking for a 1957 TR3 project. 1925 Tudor, Running, good tires and upholstery. Please contact Ken and Barb Canning at 403-932-5522. Restored 1918 alberta license plate for sale $150. Contact me if interested. Camrose Alberta. Good Day I have a 1917 touring car in need of major restoration. I was going to restore it as a light patrol car from the Great War; however the floods of 2013 put a ding in my plans and I had to restore my home instead. Time has gotten away from me so I will have to find a new home for this old gal. I still has its complete headlights and windscreen frame, and after market coil springs on the suspension. The museum is considering developing a new program on “Learning to Drive a Model T” much like the Gilmore Museum in the US. We are looking for an additional Model T to have as a backup vehicle to our Vintage Vehicle Tour fleet. Contact Ron 587 436-7567. He is asking $2,500 but is willing to deal.